Many people choose to bring their houseplants outside during the summer to bask in the sunshine and humidity… but, how do you bring plants back indoors without the bugs!? 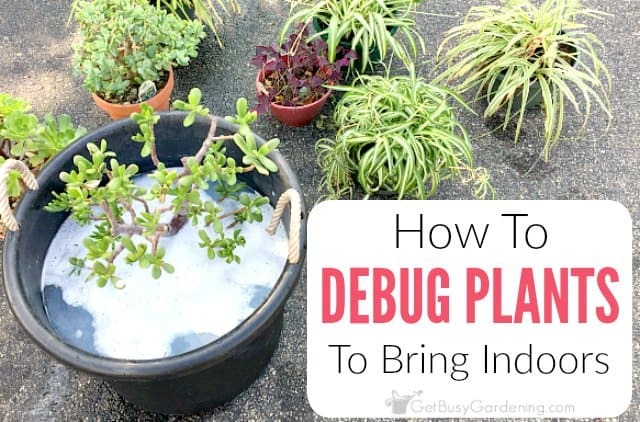 In this post, I’ll show you exactly how to debug plants to bring indoors for the winter, step-by-step. Summer is a wonderful time for growing plants. Indoor plants really benefit from being outside for a change but, when fall comes and it’s time to bring your houseplants inside for the winter, things can get ugly. Two things that will help you avoid major problems with your plants later on are knowing when to bring houseplants inside, and also how to bring plants indoors without bugs. It’s important to take a few steps to ensure the transition is painless for both you and your plants, and avoid bringing bugs and houseplant pests indoors. 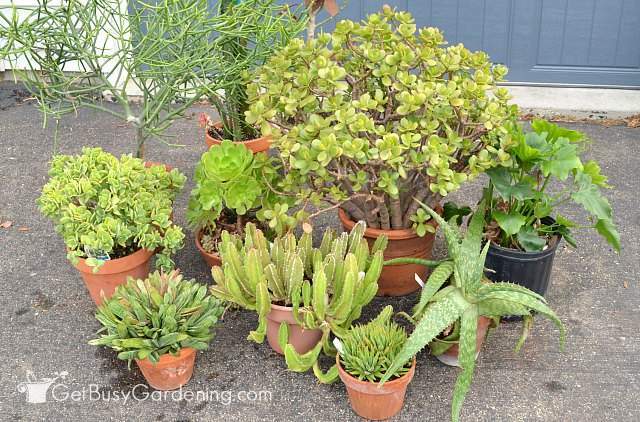 One of the most common questions I get from readers is when should I bring my plants inside for the winter? Plan to start bringing your houseplants back inside several weeks before cooler weather hits in the fall. If indoor plants are left outside for too long, cold weather could trigger them to drop their leaves. Or worse, it could kill the plant. 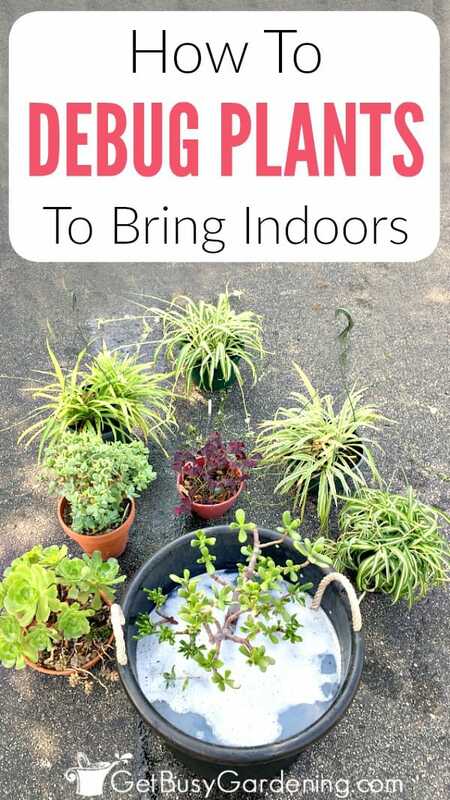 Plus, the transition of bringing outdoor plants inside will be more of a shock to them if they are left outside too long when the weather starts to cool down in the fall. A good rule of thumb for when to bring houseplants in for winter is at least two weeks before your average last frost date. If you have a lot of houseplants growing outdoors, I recommend bringing plants back indoors in small batches. Trying to do a marathon weekend of debugging and moving plants back inside can be very stressful and exhausting for you (and hard on your back!). Also, if you discover that a houseplant is pot-bound, re-pot it into a larger container before moving it inside. That way the mess will stay outside. Debugging and cleaning potted plants before bringing them back inside is a crucial step to avoid houseplant bug problems. Aphids, mealybugs and other houseplant insect pests aren’t normally a problem when potted indoor plants are outside, but can quickly turn into a major infestation during the winter if they are brought inside on your houseplants. Debugging and cleaning potted plants before bringing plants inside for the winter sounds harder than it really is. There are a few simple steps you can take to ensure your houseplants are bug-free before bringing them back indoors in the fall. Step 1: Fill tub with soapy water – Fill a large tub/bucket with water and add a few squirts of a mild liquid soap (I use mild liquid soap). I want to stress using a mild liquid soap. Be sure not to use any soaps that contain degreasers or detergents. Those can damage (or even kill) sensitive plants. Step 2: Put plants into the water and soak them – To kill any bugs on houseplants, soak the whole plant, pot and all, in the tub of water for about 15-20 minutes. The soapy water will kill any bugs that are on the plant or in the soil. Step 3: Clean plant leaves that are not submerged – If any of the leaves aren’t completely covered by the water, use an organic insecticidal soap to clean the plant leaves that are sticking out of the water. My recipe for DIY insecticidal soap is 1 tsp of mild liquid soap per 1 liter of water in my spray bottle. If you don’t want to mix your own, you can buy an organic insecticidal soap instead. Tip: When you put the plants into the water, dead leaves, bugs and other debris will float to the top. So remove all the floating pieces you can before removing your plants to keep them nice and clean. I use a wide kitchen strainer to skim all the debris off the top of the water before removing the plants from the tub. 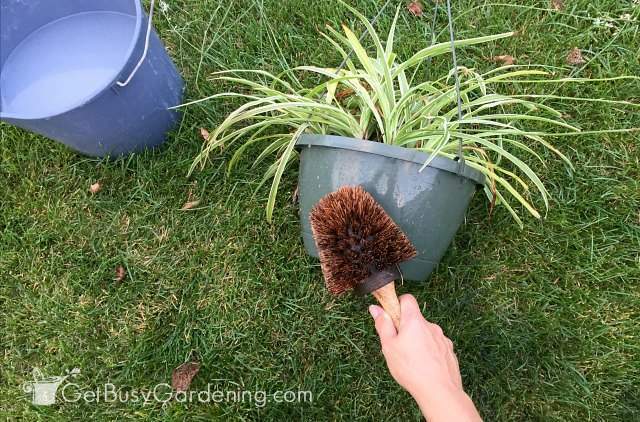 Step 4: Remove plants and scrub the pots clean – After soaking your plants, pull them out of the tub and scrub each pot with a scrub brush to clean it (here’s the one I have Flower Pot Bristle Brush). 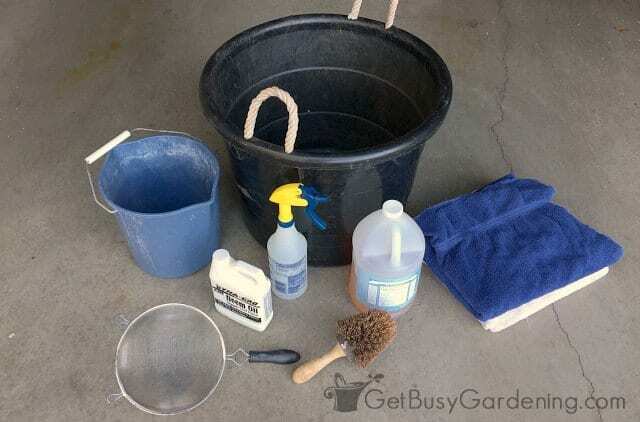 Step 5: Give the plant and pot a good rinse – Once you’re done cleaning your plant and the pot, rinse the whole plant and the pot thoroughly with the hose to get all the soap and dirt off. Step 6: Allow the water to drain completely – Set the clean plants aside and allow all the water to completely drain from the pots before moving the plants back indoors. 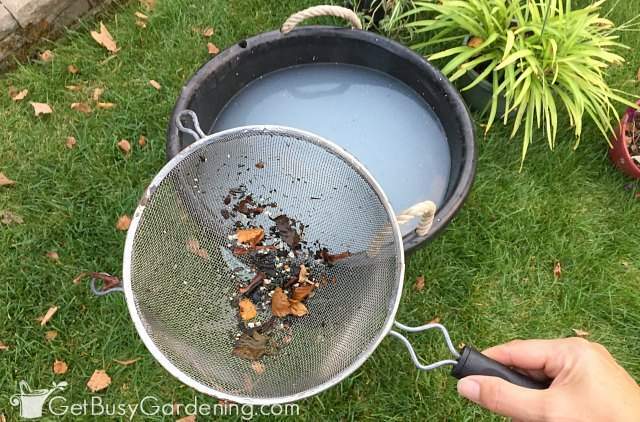 Step 7: Remove all the dead leaves and other debris floating on top of the water (using your trusty kitchen strainer) before soaking another batch of plants. 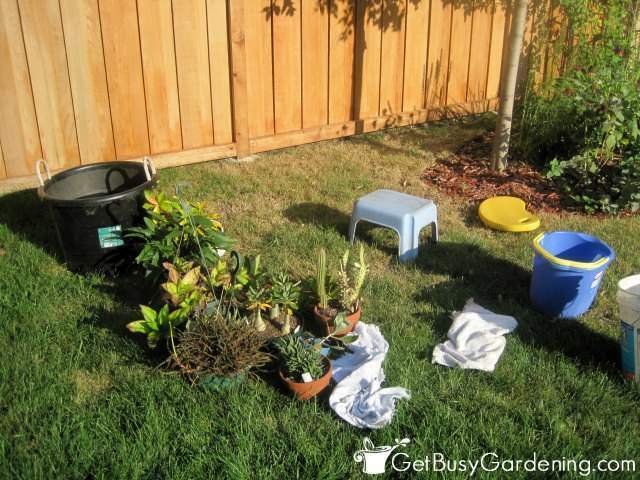 Step 8: Bring your plants back inside – Now that your plants have been debugged and all of the excess water has drained out the bottoms of the pots, you can move them back inside. Once you have them put back into their indoor spot and ready for winter, be sure to allow the soil to dry before watering them again to make sure you’re not over watering them. Of course the main benefit of soaking houseplants in soapy water before bringing them back indoors is killing all the bugs, but there are a few other benefits too. This method for debugging and cleaning potted plants is great because now your houseplants will get a good watering before you bring them back indoors! That means you won’t have the added step of watering all of your houseplants once they’re inside (you’re welcome!). 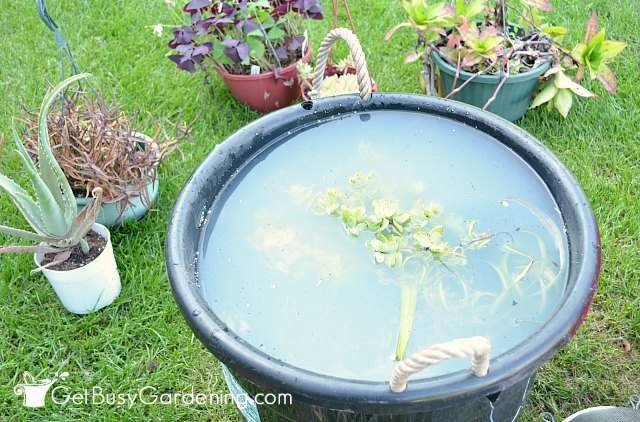 Another added benefit of soaking plants in water is that all the dead leaves and other debris will float to the top, making it easy to discard. Your plants and their pots will look sparkling clean too, probably cleaner than they’ve ever been. It feels great to have such clean, healthy looking plants, and it’s good for the plants too! But wait, what about houseplants that are too large to fit into a tub to soak? 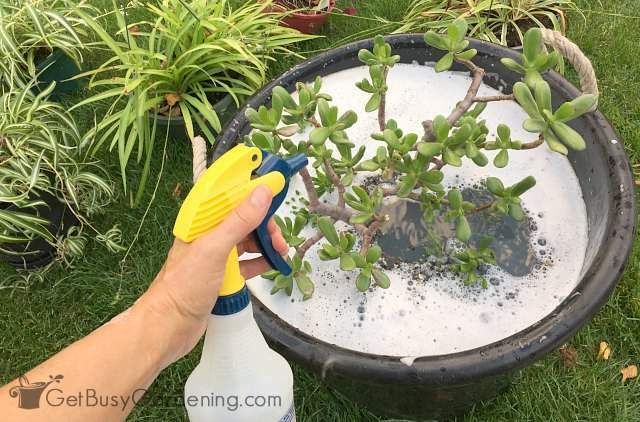 I wash the plant leaves and the stem of the entire plant with soapy water (using the same mild liquid soap I use for soaking plants), and then rinse it off thoroughly using the garden hose. Keep in mind that even if you go through all the steps to debug and clean your houseplants before you bring them indoors, you can still have problems with plant pests. Mealybugs are especially tricky because they can live for several months without a host plant, and hide in tiny cracks and crevices. So, if you find any plant bugs after bringing houseplants inside for winter, you could spray the infested plant with a Neem oil solution, a pre-mixed organic horticultural oil or hot pepper wax spray. Yellow houseplant sticky stakes work great on flying pests like soil gnats and white flies, and are also non-toxic. 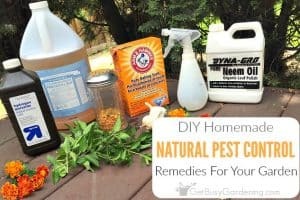 I recommend using these all-natural products to kill plant bugs because they work better than the synthetic ones – plus, I’m sure you don’t want to be spraying any toxic chemical pesticides in your house. To learn more, read about my natural pest control home remedies for houseplants. Debugging potted plants before bringing them back indoors is a critical first step in indoor plant pest prevention. This method of soaking houseplants in soapy water to get rid of the bugs works great for most types of plants, and will help to make sure you bring outdoor plants inside without bugs. Trust me, starting the long winter off with clean and healthy houseplants will make indoor plant care SO MUCH easier for you! But, if you do end up with an infestation, then learn about how to get rid of houseplant bugs here. If you’re looking for more help for how to keep bugs off plants, my Houseplant Pest Control eBook is an essential guide to help you debug your houseplants for good! Download your copy today! Where Do Houseplant Pests Come From? How do you debug plants before bringing them in for the winter? Share your tips in the comments section below. Such a timely post! I just brought a few things in last night, since we're finally starting to get a chill on the east coast. This is one of the first years I've had outside plants (used to move around too much) so I'm thrilled to be able to bring them inside. How much soap do you use in the water? Nice post! Never knew of debugging and cleaning! I always just brought my pots in right away. I will be extra careful next year. How informative! Thanks great post! @Megan – I didn't measure, I used a squirt. 🙂 I use soapy water in my spray bottle to fight spider mites and aphids and I use about 1 tsp per quart of water and that works great. I'm guessing the ratio was less in my tub of water though. @Sasha – Glad you found the post helpful. Good luck with overwintering your plants! Can you use any kind of soap? 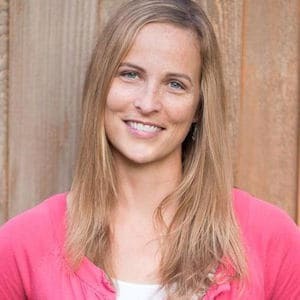 Tara – I've read that soaps that are heavy on detergent can cause damage to some plants. Most of the forums and articles I've read recommend using a mild soap. I have heard of people using different types of soap though. I've only had one plant damaged by soapy water spray a few years ago (and I have a lot of plants!). Since I was a little girl, I watched how my grandma used her soapy left-over water from dishes or laundry for all her plants. She lives in Mexico and has a very large, beautiful garden that includes plants, flowers and trees. Yes, I also use that to water my plants, it is called gray water. It is a way to conserve on water. Sounds great but can this be used on herbs? Sure, you could use this method with herbs. If you're worried about the soap causing damage to the herb plants, you could skip the soap and just soak the plants in water. Bringing bugs in is always a problem. These are great instructions. Nicely described. Thanks. So timely! I am trying to envision soaking the plant. Does the soil ever get loose and float away? Great question Anne (and I will add more detail about this to the post). The dirt will not float away if the plant is established. But if you try this with a newly repotted plant… yes, some of the dirt will float. So, if you plan to repot a plant before bringing it in, I would recommend soaking it and debugging it first, then repot it. Very helpful! Do you think this technique could also work for orchids? I have a small but persistant scale outbreak on a couple of indoor orchids….thank you!!! This is an urgent question..when doing the debugging method by submerging the entire plant in a bucket with Dr Bronners soap and water can you repeat this with other plants in the same bucket one after another without changing the water? This not mentioned as I have lots of plants to debug and don’t really want to start over with new water and soap for each plant. What I’m afraid of in using the same water and soap do you risk transferring bugs to the next plant? Yes, you can use the same water for multiple plants. The soap will kill the bugs, so no worries of them transferring from one plant to others. I use a mesh kitchen strainer to fish the debris out of the water (that floats out of my plants) to keep the water clean between soakings. I have a hibiscus tree that was outside all summer. It’s too big to dip into a tub. How do I debug my tree before bringing it into my home? I wash the leaves of mine with soapy water and then give it a good rinse. Then I spray it with neem oil, and let it dry a bit before bringing it back inside. What about treating the soil in the pot? You can soak the pot in the water, as described above, then wash the leaves while it’s soaking. Thank you so much…I have many plant right now with bugs and they are very large 4-5 feet tall. But I also have smaller ones that I used your method with. Is a repeat in a couple of days necessary or a one time should be adequate? No, you don’t need to repeat it unless you see bugs again. I only do this once per year to my plants, and that’s right before I bring them indoors for the winter. I have a question…. how do I treat large plants too big or heavy to submerge?. Thank you so much. I wash the leaves with soapy water, and then spray the whole thing with Neem oil. Test any sprays and soaps you use on a leaf first to make sure they don’t cause any damage to the plant. In the larger plants, I understand the washing of the leaves and stems and then spraying on the Neam Oil but what about the soil? How do you debug the soil since the pots are too large to soak? You could still soak the pot in the soapy water, that’s what I do. Otherwise, you could flush the soil with the soapy water solution, which should help too. Thanks so much for the detailed tutorial! I have a fern that took me six months to rescue after it withered last winter indoors (I had a cloche over it that had broken). It took so long to get it back to health that I didn’t just want to compost it once the frosts hit. Now I know how to get it back inside this winter (with a new cloche!) without inviting the bugs, too. Thanks again! Hello! I have never soaked my plants before and am afraid to try a soap. This soap really is okay to completely soak plants in? This is my first time bringing plants in for the winter!! I have never had a problem, but some plants are more sensitive than others. You can make a soapy water mixture and pour it into a spray bottle (I use 1 tsp Dr. Bronner’s Baby-mild Liquid Soap per 1 liter of water), and then spray it on a few leaves of your plants to test it before you soak them if you’re worried. That way you can see if your plants are sensitive to it or not. Oh, and don’t soak plants that have furry leaves, like African violets. It looks like you used this method for sedums as well? I have quite a few that I bring in. I assume this cannot be done for African violets? I keep them on my screened porch through the summer – they thrive there. Yes, I do this with all of my succulents plants. You’re correct, you don’t want to use this method for African violets, they don’t like it when their leaves get wet. I live way out in the country, can I use Johnson’s baby shampoo instead. I only have Dawn dish soap around the house. Thank you, this is a wonderful article. I have never bought that brand before, but it sounds like it would work since it’s gentle and made for babies too. Test it out on a few leaves first like I mention in the post. Definitely don’t use the Dawn soap. I have used Dawn dish. Detergent in the past and it worked fine on house plants but never did any fuzzy leaves. As I said, some plants are more sensitive than others, so it’s always best to test any type of soap you use on a few leaves before using it on the whole plant. They use dawn to clean animals covered in oil – dawn has never hurt any of my plants. I understand how to de-bug my potted plants before taking them indoors. My question is how do I make sure there are no bugs or bug eggs in the soil in the flower pot? This method should kill the eggs too (the soap kills bugs and eggs). But, there could still be some eggs that survive in the soil (especially soil gnat eggs). If you have issues, you could remove the top 1-2 inches of soil and replace it with fresh, sterile potting soil. That will remove the eggs. Just be sure to throw the old soil outside or in the garbage bin (not in a garage can in your house). Hi, can I use this method to debug potted plants just for the debugging? Sounds like a good method even if you don’t need to move them inside. I have trees that are potted they are too big to soak what can I do? I use a spray bottle filled with soapy water to spray the leaves. Then I’ll gently wash them, and then hose the plant off. 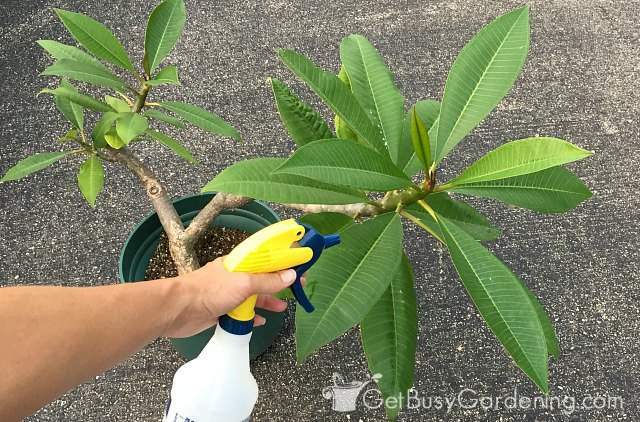 You can also spray them with Neem oil if you’ve had pest issues on those plants in the past (or if pests show up after you bring them inside). Do spiders and spider eggs come in on house plants/trees? I’ve never thought to do this but now you explain it seems like such a “doh!” moment. Of course bugs will come in with the plants, this is so simple and quite brilliant – thank you. Hi! Great article! Hope you can help me out as I need to do this fairly soon. I have a fairy garden in an old wagon with English tears and other ground covering plants. I want to debug and replant them in smaller containers indoors for the winter. Can I just remove each plant one by one and submerge without the container, and then replant it in the smaller terrarium type bowls? Or will I lose all the dirt that way? Do you think it would work? Please advise! Thank you. I think that would work just fine. You will probably lose some of the dirt, but I don’t think that would be a problem. I think it would be fine if you soaked it when it’s bare root and then potting it up right after. The key for getting rid of soil gnats is allowing the top 1″ of soil to dry out. Soil gnats thrive in wet soil. 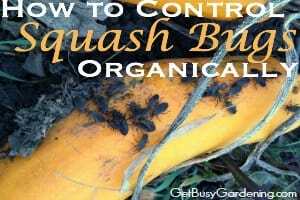 Here’s more info about about how to control soil gnats. Thank you very much for the speedy reply. I am actually going to be transplanting today. I will give an update when done. ?? Have had great luck this summer with NZ impatiens and begonias and would like to try overwintering. I have a cool, south-facing room in which to keep them. They’re in 10″ hanging pots outside now, quite full and still flowering in Cleveland,OH. Several questions: the immersion method of debugging seems that it would drown the roots as I don’t believe they would ever drain so any other options other than replacing all the dirt; how much should they be pruned back and when(they’ll be shocked enough coming inside); will removing the top 2″ of soil from my 8′ grapefruit tree remove all the bugs that may have invaded the pots over the summer (can’t submerge it and I hate earwigs! )Thanks for your help! If you have them in a pot that has drainage holes, the dirt should dry out just fine. I have never tried overwintering impatiens before, so I can’t speak from experience… but I would bring them in and wait to see how well they do inside. You’re right, they will probably go through some shock. I would give them a few weeks to adjust, and then trim the back if they look like they need it. As for the begonia, if they are tuberous begonias, I let them go dormant during the winter and overwinter them in my basement. They tend to want to go dormant anyway, and for me it’s easier to overwinter them that way. Here’s how to overwinter tuberous begonias. Otherwise, I would do the same thing with them as I suggested with the impatiens. And for the large tree, you can also wash the leaves with soapy water and rinse them with the hose before bringing it inside. I also use neem oil on my large plants if they tend to struggle with pest issues. Hi Amy, I’m about to use your debugging method on bringing houseplants inside for the winter. Is it OK to use Dr. Brothers pure Castile soap with lavender in it or will this hurt the plants? I would recommend using the Baby Mild instead of the lavender. The Dr. Bronner’s scented soaps are still organic, but they contain essential oils and I’m not sure how the essential oils could affect certain plants. I use a big bucket, but a storage bin or something like that would work too. I wouldn’t do it in the bathtub because there will be dirt, leaves, dead bugs…etc in the water after you’re done soaking the plants, and you don’t want all that going down the drain. i have alittle over 30 potted plants outside, i don’t have a green house to store them in during winter, what type of set up do you recommend for all these plants during the winter months? I just bring mine inside the house and put them in different rooms for decoration. I have a small indoor greenhouse that I also use to store plants that need extra humidity. It really depends on the types of plants you have. After soaking my plants and letting them drain, how do you get them to dry out so the roots won’t rot. After moving my plants back indoors, I don’t water them again until they need it. I’ve never had a problem with the roots rotting on any of my plants. Just make sure the pots have drainage holes and good drainage. I do this every year. In a previous comment you mentioned to not use Dawn dish soap but that’s what I’ve been using – blue (think it’s original) – & have seen no problems. I have left over bread trays from my husband’s route that I turn over. I put my potted plants on these trays to drain. The holes allow complete drainage. I use a bucket for smaller plants & plastic kiddie pools for larger plants. After everything is dry, sometimes I sprinkle food grade diatomaceous earth on the soil of each pot before bringing in. A detergent like Dawn may work well for the types of plants that you have, but it is still important to be sure to test each plant before soaking it in water containing heavy detergent soaps. Some plants are more sensitive than others (and I’ve killed a few using the wrong type of soap). It’s better to be safe than sorry. How does anyone deal with the awful smell of the insecticide? I used it on the plants and they are drying out so they are not soaked before I bring them is. The smell from the container I mixed it in is smelling up my basement. Skip the chemical pesticides. They are toxic to your family and pets, and they linger for a long time. Plus the bad bugs can build up a resistance to them. I highly recommend switching to using organic products on your plants. Neem oil is amazing, and works better in the long run than any chemical pesticides. It does have a strong smell, but I leave my plants outside for a few hours after spraying them, and the smell goes away. You can also use like Dollar Tree Baby Shampoo. Very mild. How do you keep soil gnats that are barely under control in the houseplants to keep from infesting that nice moist soil? Allow the soil to dry out before getting the plants back on their normal watering schedule. 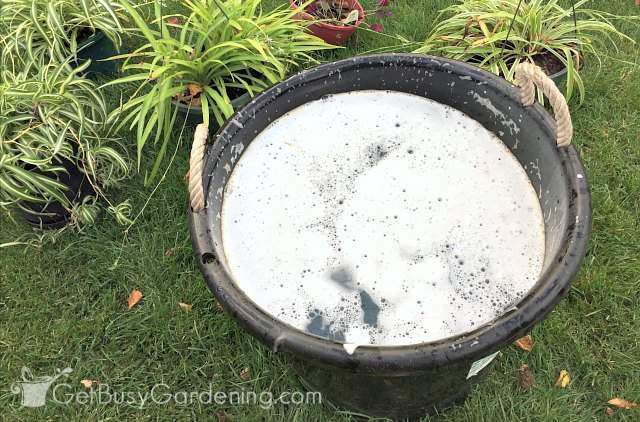 Here’s a post I wrote about controlling those pesky soil gnats… How to Control Soil Gnats. I have a large pot that I want to soak but it doesn’t have drain holes. Should I just use the method for large plants as mentioned? How do you get all the other “stuff” out of the dirt if you don’t soak it? Great post, thanks. Thanks for the info. Luckily I had the tree in a pot on wheels and moved it under cover when we were expecting rain. I guess I’ll have to find a large pot possibly on wheel with drainage. Then I can find something to put under it to catch any extra water. It’s just getting too big to pick up and move. I have some almond scented Dr. Bronner’s Castille soap. Will that be ok to use? I don’t use the scented ones because they contain oils, and I’m worried the oils could damage my plants. You could try it by testing a it on a few leaves first. Wash a few leaves with your soap, then rinse it and watch your plant for a few days (I’d wait at least a week) for any signs of damage. 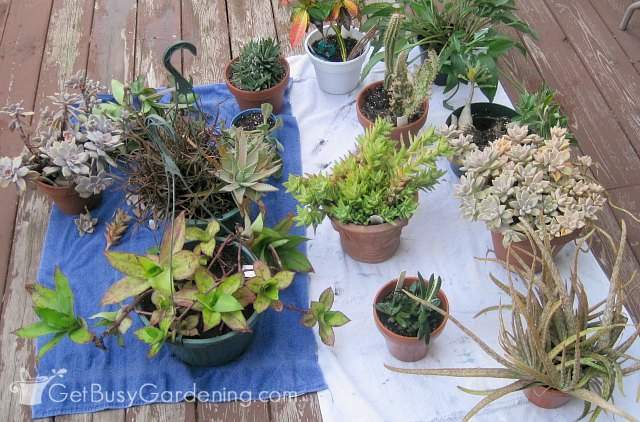 I use this method of debugging plants on all of my succulents, including echeverias. 🙂 But, some plants are more sensitive than others, so if you’re worried, be sure to test it before you soak the whole plant. Spray soapy water on a few leaves, rinse it and let it sit for a few days to make sure the soap didn’t cause any damage to the plant. Where do you find neem oil? I buy my neem oil on Amazon here. You should also be able to find it at your local garden center. Can this be used on citrus plants, aloe or christmas cactus? how about edible plants? will the soap kill the roots? I use this method for debugging plants on all of my my aloes every year, along with all of my other succulents. I have never tried it with a Christmas cactus because I don’t put mine outside during the summer, but it should work just fine. I always recommend testing the soapy water on a few leaves, rinse it off and let it sit for a few days to make sure it doesn’t damage the plant before treating the whole plant. The soap will not kill the roots, but make sure the pots have drainage holes in them to avoid overwatering. I have 2 Pothos, 4 mother-in-law plants, and an Aloe Vera plant in drain-less wall hanging planters. Another drain-less planter also has several small succulents. — 1 of the Pothos plant has a white-snow like substance on it’s cascading leaves and we have had some issues with soil gnats in recent months, although not as bad lately. I’m thinking the Pothos has Aphids or spider mites. I was wondering what you thought would be the best method here since the planters have no drainage. 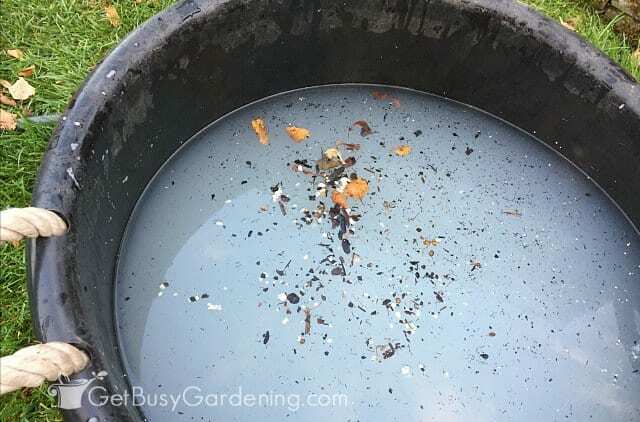 I was thinking about doing your soap soaking method, allowing the soap to kill any of the infestations, then immediately removing from water and replanting with fresh activated charcoal pebbles and fresh soil. Does that sound right to you or what would you recommend? Whatever it is, I want to do it to all my plants so I know Im starting fresh with clean plants and not just cleaning the obvious infected Pothos, seeing as that any of the others could be contributing to the gnat problem as well. Thanks so much for your time and knowledge. It’s greatly appreciated. The gnats are called fungus gnats, and are caused by overwatering (they thrive in wet soil). Here’s more info about them… How to Get Rid of Fungus Gnats In Houseplants Soil Growing plants in containers that have no drainage will make it difficult to get rid of them, so I recommend trying a product called Gnatnix, which will work great for you since it sounds like you don’t have a ton of planters. I would not recommend the soaking method for pots that don’t have adequate drainage holes. If you plan to repot everything anyway, then you can soak your plants bare-root to try to gain the upper-hand on the mealybugs, then repot in fresh, sterile potting soil. Be sure to also wash and sterilize the planters and the area around where your containers are sitting thoroughly, because mealybugs like to hide. Mealybugs are tough opponents, and are difficult to get rid of, especially if you put your plants back in the same spot as they were before. So, even after soaking, be sure to keep a close eye on your plants for signs of new bugs, and spot-treat them as needed. 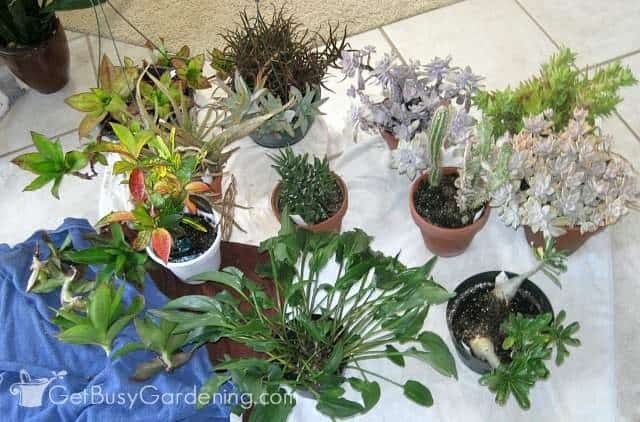 Repotting everything sounds like a lot of work though, so instead, you might consider trying to fight the pests first instead of soaking and repotting everything. If the mealybugs aren’t too bad, and you only see them on one plant, you could remove that plant from the planter and soak only that one. Then, pot it into a new container and keep it away from the other plants. Watch the rest of the plants for signs of mealybugs, and spot treat as needed. You might get lucky and catch them before they get too bad, and by removing the one plant, you may be able to get rid of them with much less effort. Good luck! Hi would this be good for succulents too, since they prefer a really dry environment? I have a small jade plant that I recently bought and there appears to be tiny black jumping bugs coming from the bottom of the plant. I noticed them in the saucer. Thanks so much! Yes, I use this method of debugging plants for my jade and other potted succulents every year. 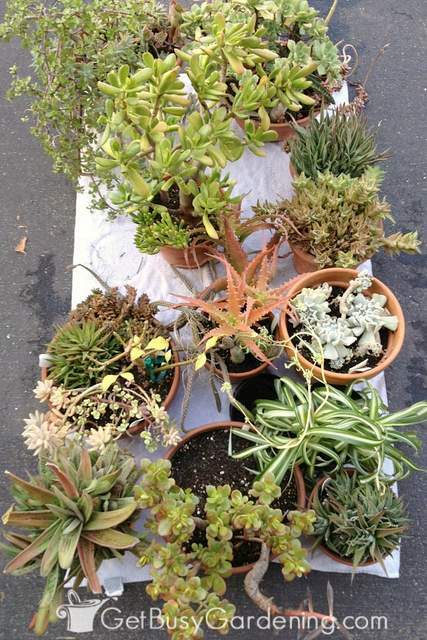 Just be sure to allow the soil to dry out completely before watering your succulents again after soaking them. I have a large selection of potted plants that i recently got from a neighbor who passed away. They are good indoor plants and already in pots but they have been left outside, barely touched all summer. I’m planning on following this method for debugging them before I bring them inside for fall/winter. Would you also recommend repotting them all into new soil, as I have no idea when the last time was that they received new soil? 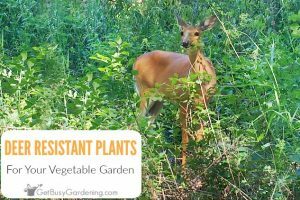 This is great info, wish I had this years ago or at least knew should I say.because I lost my entire plant collection some 15 plus plants and trees because of spider mites that attacked my plants. I now use the soapy water method for my larger plants and will for now on use this method as well. I have started a new collection, it was too painful for a while because I felt so bad about not protecting them that I just didn’t buy any plants for quite a while. Well I don’t want to stop having plants in my life, they bring me so much pleasure. Thanks soooo much for sharing this very valuable information. Hello! Thank you so much for all this information on how to debug plants. It’s extremely helpful. I do have a question though, I have to clean all succulents and cacti is there a way to know if a succulent/cacti wouldn’t tolerate being submerged? Is it better to just test the leaves first like you have mentioned? Thanks again! Yes, I would recommend testing the soap on a few leaves before using this method for debugging your plants. Give it a few days and if there’s no damage, then it should be safe to treat the whole plant. Shake off all dirt .Cut off leaves,cut off spagett like roots ,put in a tub of peat moss for the winter. No, you don’t need to worry about debugging plants that you’re overwintering as dormant bare-root bulbs like you describe. Hi! Great article. I have 2 desert roses and I was wondering if this would work for them. I know you said that you’ve used them for your succulents, but I wasn’t sure if desert roses are exactly succulents. Yes, I have used this method for debugging desert roses, and it works. Just be sure to allow the soil to dry out completely after it’s done soaking before watering again. And, if you can, allowing the soil to dry out completely beforehand will also help to prevent overwatering. I have tomato plants & pepper plants that I would love to bring indoors to continue our harvesting season. Plus there are many flowers still on the plants. 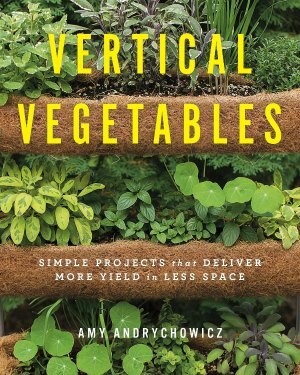 Can I use this method to soak veg plants for 15-20min. In……Baby shampoo? …….No Dawn Dishsoap? Have both. I’ve never tried using this method for debugging vegetable plants before, but I don’t know why you couldn’t. I would test the soap on a few leaves before soaking the whole plant to make sure there’s no damage. I recommend using a mild liquid soap (I use this kind). Dish soaps contain degreasers and detergents that can harm sensitive plants, so I definitely do not recommend those without testing them first. It should work fine for debugging passion flower. Just be sure to test the soap on a few leaves and leave it for a few days before using this method to debug the whole plant. Just keep in mind that plants will go into a bit of shock when they are moved from growing outside to being indoors. So, your plant may drop some of it’s fruit in response to being moved indoors. Very informative post, thank you! I have a miniature rose potted outside right now, would this process work for roses as well? I really want to bring it inside because it’s doing beautifully this year and I’ve never had luck with them before! I have never tried it with roses, but I don’t know why this method of debugging potted plants wouldn’t work for them. Be sure to test the soap on a few leaves and wait a few days before treating the whole plant just in case. Do you use diatomaceous earth on indoor houseplant bugs like mealybugs, fungus gnats and spider mites? how can I debug 3 foot tall by four feet wide ferns to bring inside? I could get the pot soaked but how about the hung span of fern leaves? If the tub you’re using is large enough, you can turn the plant on it’s side to submerge the whole thing under water. Otherwise, follow the instructions above under the section titled “Debugging Houseplants That Are Too Large To Soak”. These ferns are huge, would a bug bomb do the trick? A bug bomb would probably kill spiders and other bugs. But keep in mind that bug bombs contain synthetic pesticides, and are not organic. 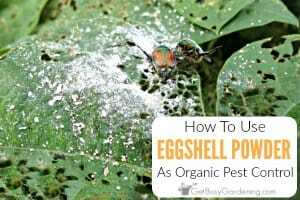 Also, houseplant pests (like mealybugs, scale, whiteflies and aphids) can build up resistance to synthetic pesticides, so a bug bomb may not work to kill them. 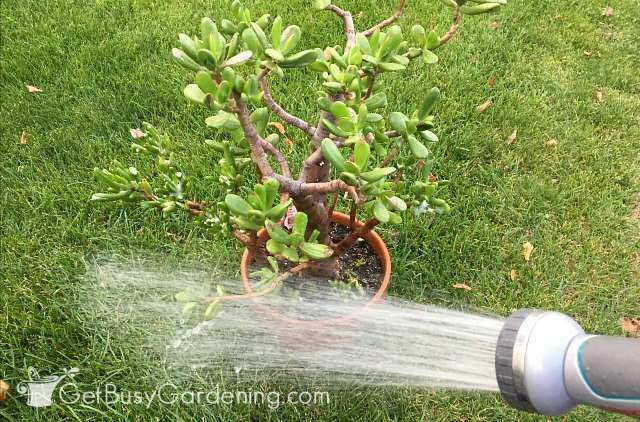 If I were you, I would spray the plants down really well with the hose, wash the pots really well with soap and water, then spray the plants with soapy water and rinse again. Then keep a close eye on the plants over the next few weeks/months to watch for any signs of plant bugs. Sometimes that’s the best you can do for debugging and cleaning huge plants before bringing them indoors. Yes! Soaking your plant in soapy water will kill the ants. Just be sure to soak it long enough. After placing the pot in the water, wait until all the bubbles have stopped coming out. Then let it soak for 15-20 minutes.